Lebanese Golden Greek, Jordanian Golden Greek, “Dwarf” Greek Tortoise, “Dwarf” Golden Greek, Syrian Golden Greek, "Terrestris" All of these names have been used to identify Golden Greeks, all originated in the pet trade and may have no bearing upon actual taxonomic designation. Congress Intrernational sur le genre Testudo - Proceedings (March 7-10, 2001) pages 78 - 108 he elevates T. terrestris to a full species. and splits the middle eastern Testudo graeca to 8 species. In the summer of 2001 a new tortoise appeared on the American market. While it was obvious that this was a Testudo of some variety, it was declared a Testudo graeca , Testudo graeca ibera , Testudo graeca terrestris or Testudo graeca flowerii. depending upon your taxonomist of choice. In other words, little was known about them other than that they had a very light colored shell and that a mask was evident on darker skinned specimens. They became known in the market as “Golden Greeks”. Until these animals are examined by taxonomists and their findings peer reviewed the actual species/ subspecies designation of Golden Greeks will most likely remain in question. Initial examinations by some taxonomists identified the species as probable Testudo graeca terrestris. As time went on and more was learned of these animals this became supported by the probable locale data from the early shipments and confiscations of a Lebanon or Jordanian point of origin. This pattern of identifying an unknown Testudo as Testudo graeca terrestris is not new. When first what is now known as Testudo graeca cyrenicae appeared on the market they were called T. graeca terrestris by sellers. and the initial point of origin was claimed to be Egypt. In that case the color pattern was distinctive enough that Testudo researchers who had seen them before knew they originated in Libya. As an incidental aside, this proved the existence of tortoise smuggling from Libya (who had no legal trade with the United States at that time) to Egypt then the selling of them and Libyan T. kleinmanni to the States as legal "Egyptians". As stated above the presently accepted point of origin for the "Goldens" is Jordan or Lebanon. With the Goldens there is the added problem of them actually being from the assumed type locality for T. g. terrestris. The Middle East is a harsh area of the world, small areas hospitable to tortoises are surrounded by vast areas that do not support them. This creates geographic islands which tend to develop their own species, subspecies and Evolutionarily Significant Units (ESU). If at all possible animals from dissimilar areas should not be mixed as they may have little or no resistance to diseases carried by others, others that are even of the same species but that may be carrying a disease without showing symptoms. In that area of the world 100 miles may as well be a thousand genetically speaking so if it is at all possible even animals that are similar and from the same general area of the world should be isolated until we know exactly what we have and a long quarantine period has passed. 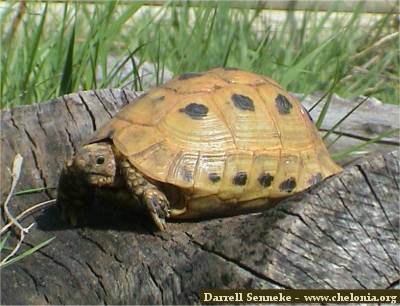 It is becoming generally accepted that there are differences between the care needed for the T. graeca subspecies, The World Chelonian Trust is far from the only one stating this. 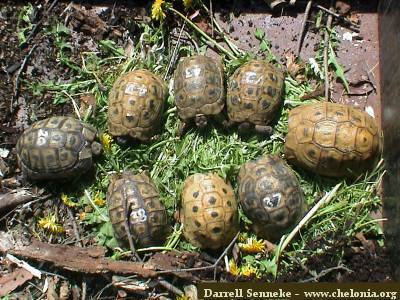 On the fine Podarcus web site they distinguish the T. graeca from the east European subspecies and geographical forms and those from Asia Minor as being the only ones that can be kept in an outdoor habitat in the Netherlands at: How to keep Tortoises. Golden Greeks kept under conditions acceptable for these do not survive unless special adaptations are made for their requirements. Problems arise when an animal enters the pet trade, without locality data and with a doubtful species designation, in that case it is the duty of the keeper to best determine what it is in order to properly care for it, preferably prior to acquiring it. Until then they have to be called something, both for the sake of providing proper care instructions and to avoid confusion, and we need to best determine what that should be. An excellent attempt has been made to show the ranges of the T. graeca complex by Torston Blanck at Landschildkroeten.com on maps in his article: Verbreitungskarten der verschiedenen Testudo Arten written in 1999. By looking at the maps you can see the traditional T. graeca is presented as 12 species / subspecies. According to these maps the "Golden Greeks" would either be T. g. terrestris or Testudo graeca flowerii both of which are found in Jordan. By the description, given below, the Golden Greek shown in the first photo on this page would be T. g. flowerii. Testudo graeca flowerii - The smallest T. graeca. subspecies (not all experts accept this subspecies and often synonymies it with T. g. terrestris). The carapace is relatively flat and of a bright dark yellow coloration with clearly defined black markings, the tail has a centered black blotch (important! ), the plastron is horn colored with individual centered black blotches. The head is of a bright yellow coloration. There is a strong similarity with T. kleinmanni which has a similar coloration and size"
The above is a pretty good description of a "Golden Greek". Still the question is posed as to if there is a "real" difference between T. g. flowerii and T. g. terrestris? For care purposes this does not matter as the requirements are the same. Add to this the fact they they are not all gold as can be seen in this group photograph and in our T. g. terrestris / T. g. flowerii Gallery , in fact some are quite dark, and the result is that at present it would be more accurate to call "Golden Greeks" either Testudo graeca terrestris / Testudo graeca flowerii or Middle East "graeca" and drop both the "Golden" and "Greek" from the common name. What has come to light since they first appeared in the international trade is that there is an established business of selling tortoises from the Middle East. What has been determined is that the "Goldens" originate from Lebanon, Syria, Israel and Jordan. Most of them are sold in Europe as "Farm Bred Lebanon" or imported into the United States as "Captive Bred". No "Farm" whatsoever could produce these numbers and also specimens older than 40 years. Other "Goldens" on paper originate from "Farm Bred USSR and Farm Bred Slovenia", both countries without any T. graeca populations at all. To the best of our knowledge what is being sold as Golden Greeks are mostly Testudo g. terrestris and Testudo g. flowerii, mixed by collection, smaller ones with the blotches being tentatively identified as T. g. flowerii, larger ones, with the much more rounded and domed carapace being T. g. terrestris (Syria & Jordan). The rather pink specimens are Jordanian, where the sand color is rather reddish. T. g. terrestris seems to adopt much more than other T. graeca to the soil of their habitat, in some locations in Syria nearly black specimens exist (black Basalt is the soil there), these have also appeared in the trade, while in the yellow desert of Syria and in the Negev of Israel, the "Goldens" exist. Congress Intrernational sur le genre Testudo - Proceedings (March 7-10, 2001) pages 78 - 108 he elevates T. terrestris to a full species. and splits the middle eastern Testudo graeca to 8 species. "Golden Greeks" are a mix of all of these species with most being T. terrestris and T. floweri . We use T. graeca terrestris rather than T. terrestris because of the accepted nomenclature of these animals by most users of the internet searching for information.